Baked some yummylicious Cheese Tartlets over the weekend. Very cheesy and fattening indeed! 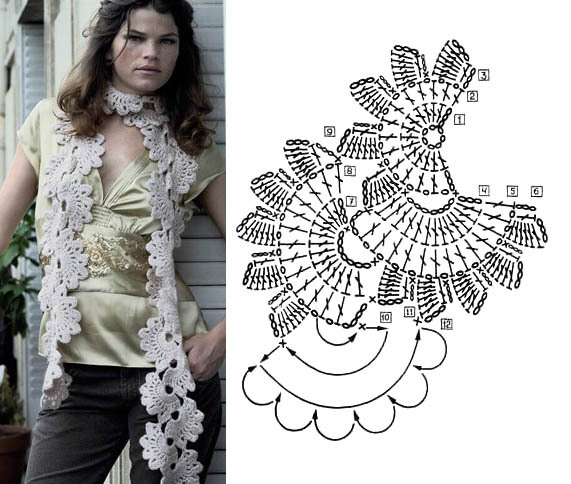 Started on this crochet project after an inspiration from Emily. A friend just told me about this cool car accessories website. It offers various accessories for all types of car ranging from European to Japanese made cars. I shall tell hubby about this site as he is interested to change some interior of his car soon. Good thing about Chevy Camaro accessories is that it has international shipments, just email them for a quote. They accept all major credit cards and ship out using reliable FedEx, Dhl, Usps & Ups ground/ air services. Short of gift ideas for a friend then check out their gift cards. Gift cards make a perfect present for friends, family and business associates to spice up the look of their pride and joy or to add some serious performance! Thinking of changing my BMW car headlights to some new Euro Projector Headlights with Amber Reflector and LEDs plus fog lights too. Driving at night with be much easier and safer too not to mention brighter! Can't wait to order online from Chevy Camaro accessories. Now need to find some mechanic to fix it for me. I won't be that worried because if it doesn't fit, I can return it within 30days of delivery of my order and get a refund via the same payment method. Only set back is I have to forego the shipping fees though. Please check out the terms and conditions for return at their site if you ever need to. Onigiri bento boxes, Blossom small cutters, Mickey+Minnie nori puncher, Chip nori puncher, Mini round alphabet cutter, Cute picks and Yum Yum Bento Box Book. How to shape a quil egg from Yum Yum Bento Book. Various cutters, silicon moulds, silicon cups, chocolate color pens, picks, nico nori punchers, panda bento box and cutting tools. Hello Kitty stuff from Japan Kitty Land!!! 4 in 1 Bento boxes and sandwich cutters. Wishing A Very Happy New Year to all readers!!! Haven't been updating my bento blog lately as most of my meals have been made speedily without any decorations! These past few days of Hari Raya holiday ate a lot of unhealthy food from eating out frequently and less homecook meals. Hopefully I didn't put on some weight, must go on the treadmill and bike everyday to burn off...sigh!! Just discovered an interesting natural health blog with lots of information on various health issues ranging from alternative therapies, exercise, men's/women's health, to nutrition updated daily. Most of the articles are very useful in our daily life usage and knowledge as well. I should be adopting a more healthy lifestyle to boost up my immune system rather than taking vitamin C too often and substitute that with more fruits and vegetables. Wishing a Happy Hari Raya and holiday to all muslim friends! Everyone in the office seems to be falling ill nowadays with very weak and low immune system of late.To stay healthy and build up our immune system is the best way to counter any virus infections. With so many cases of A(H1N1) is better to take precaution and join a health forum to learn more about the latest health issues happenings around the world. Eating a balance diet is a must nowadays as the food we eat causes a lot of side effects without us knowing. Most are loaded with pesticides or antibiotics and are harmful to our health when consume in large quantities. Nowever I stumble upon this forum which has a lot of nutrition information provided from vitamins to organic food. Sometimes I feel is best to pack a bento lunch to work rather than eating out as I find the food outside is too S.O.S ( salty, oily, sweet). To prepare what to cook at home, do check out these easy recipes from the forum which has lots of ideas on preparation ranging from fruit juices to anti cancer soup! It's better be fit rather than stocking up on tamiflu or be wearing what N95 mask which doesn't really filter the virus as most N95 respirators are design to filter 95% particulates of 0.3micron while the size of the virus is about 0.1micron! Some simple preventive tips will be frequent hand washing, resist temptation to touch any part of face, gargling with warm salt water to prevent proliferation, eat more vitamin C and drink warm liquid. 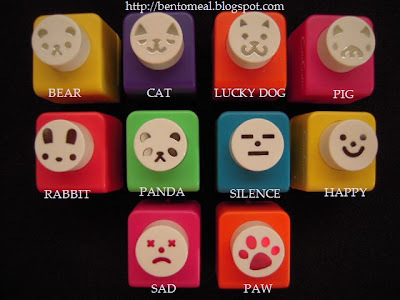 Cute Expression CARLA CRAFT Punchers for Sale! Lucky Dog, Pig, Paw and Sad out of stock at the moment. Rounded rice mould in different sizes, alphabet A-Z cutters, number 1-9 cutters, Hello Kitty ice/jelly tray, small animal/Stitch/Hello Kitty picks, Stitch baran, Melody+Piano and Sugar Bunnies steel bento box. Special Thanks to Shoppingmum for sending the Melody+Piano steel box all the way from Thailand for me! 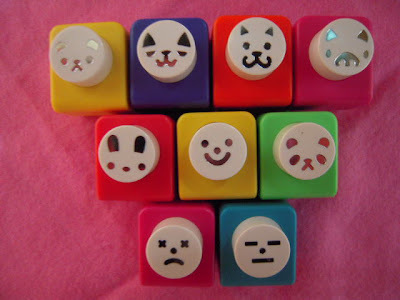 Carla Craft "Expression" Punchers completed + new Bento Tools! Finally with the purchased of the last 2 shown below, my collection of "expression" Carla Craft punchers are completed..hooray!! Took me sometime to accumulate all the punchers checking out the stores on and off. Hopefully I didn't miss out any ......Lol! For anyone doing kyaraben bento these are a must for nori as they are real sharp and durable, my all time favourites. 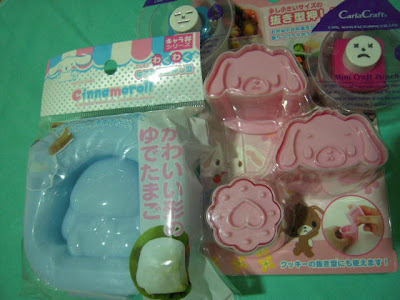 Sanrio Cinnamonroll egg mould, Sugar Bunnies multi cutter from NST and the last 2 Carla Craft punchers added to my bento tools collection recently. Have yet to test out the bento tools..sigh! Simple theme. Theme images by minimil. Powered by Blogger.